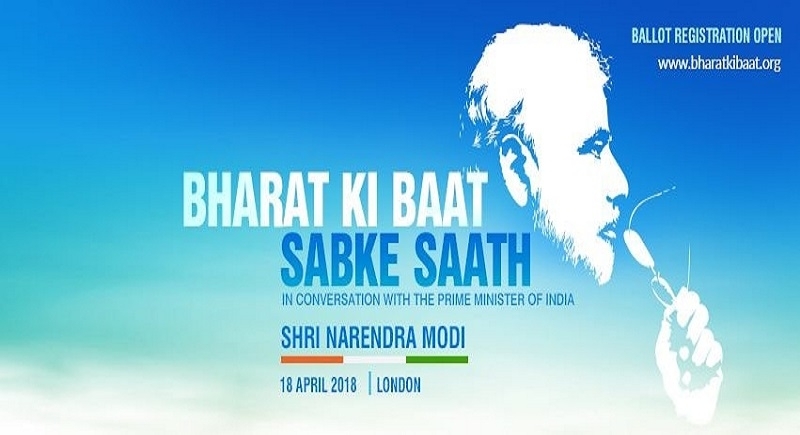 New Delhi, Mar 29: After the most successful event at home “Man ki Baat”, Prime Minister Narendra Modi has embarked upon the most unique and interactive event with the diaspora in the United Kingdom. The event titled as “Bharat ki Baat Sabke Saath” the Prime Minster will directly interact with the members of diaspora on April 18, 2018. This event is scheduled to take place in Central London. The website bharatkibaat.org has been specially designed for this event. Those who want to join are asked to register on the website before April 4, 2018 midday to get ballots for free invites to the event. Those who are interested in participating in this event are expected to give the reason for their participation in minimum 25 and maximum 100 words. For those interested in India and matters related to the Indian diaspora this is a great opportunity to be kept up to date on further events and services. The participants will be kept informed on events, services and news on India from the wider Indian community, the website said. Dr Vijay Chauthaiwale, Incharge of Overseas Friends of BJP wrote on his Face book about the event describing it as a “unique niche event"… "Titled as ‘Bharat ki Baat Sabke Saath’ it will be one of its kind interactive conversation with Prime Minister Shri Narendra Modi,” he said.